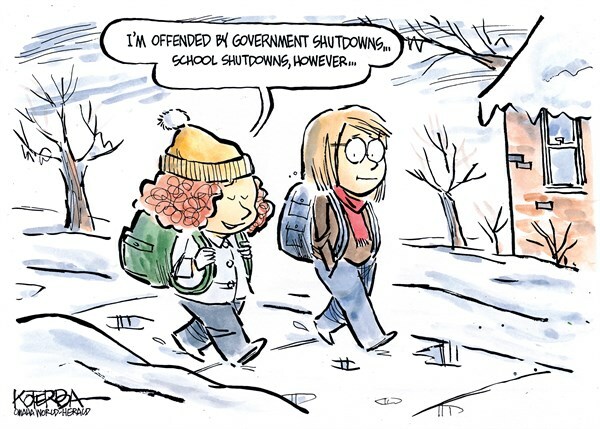 To make up snow days — or polar vortex days — students would rather lose a holiday than extend the school year. Many studies show that low temperatures and high temperatures classroom can affect a student’s ability on focusing in class, low energy, and memory ability. According to an article in Riverside Brookfield landmark, “With eLearning days cold, snap’s no problem at RBHS,” Riverside-Brookfield High School was shut down for two days but didn’t call school off. They provide “eLearning days,” where students are expected to do classroom assignments at home online. In fact, according to the article, students don’t have to make up the missing school days due to the cold. In a survey of 108 Morton East students, 71 students said they would rather make up snow days by removing days from remaining holidays like President’s Day, and 37 choose additional days at the end of the year in May. “Our first e-Learning day will be March 4th, Pulaski Day, and I’m pretty excited about the idea of not really having to make up snow days anymore — because we never lose a learning day to inclement weather,” said English teacher Mr. Kent Frankfother. Some students think that online learning allows for too much distraction, but they like the idea of not having to add days to the school year. “People are going to find the answers online, and I prefer doing it on paper. I mean if they had to add days at the end of the school year, then no,” said senior Iberus Jenkins. There are some students who prefer doing school work with paper and pencil because they don’t have to deal with technology. “In my opinion doing work online can be complicated for many students. For example, if your WIFI doesn’t work, you won’t be able to turn in your assignments, and it can affect your grades,” said senior Maria Placensia. Many students have different opinions as to having online assignments. “I think it’s better, but at the same time (some) students are not going to do it,” said sophomore Elizabeth. Students will face issues when it comes to logging in online. “A lot of people are not going to do it, or they’re going to forget their password for their laptops,” said senior Malikee. i’d day it’d be a good opportunity for students who always do their work, it would likely be like homework given over break and even if there are students who don’t do it at least the students who do don’t have to worry about missing that day of work. I feel like the school days should be added, but at the end of the year because we would lose holidays or make them shorter. The fact that Riverside Brookfield doesn’t have snow days and now has the ability to still continue school online when the weather is not cooperating, shows that technology now more than ever is an important role in our everyday lives and continues to get better as time goes on. I agree that we should lose a holiday than extend the school year. This is a good idea because students can do their work from home without having to go to school. It can also be something negative because there might be technology problems at home that prevents them from doing their work. I will prefer to sacrifice one holiday day that extend the end of the school year. In a sources said that there’s always more work done in paper that in a computer a lot of students said that their laptop did not work well, the WiFi can be damage by the snow, and then their grades get affected by not turning in an assignment even thought they try to do it. I agree that we should lose a holiday than extend the school year. It’s way smarter than having to stay another day of school because it is going to be way hotter. Your’e going to want to just leave the hot school so thats why it will be way better to take a holiday off instead of extending the year. This was a really good article very interesting with lots of facts.